I took more photos on my second visit so I am sharing them here. Our new Tablecloth had it’s first outing this time. 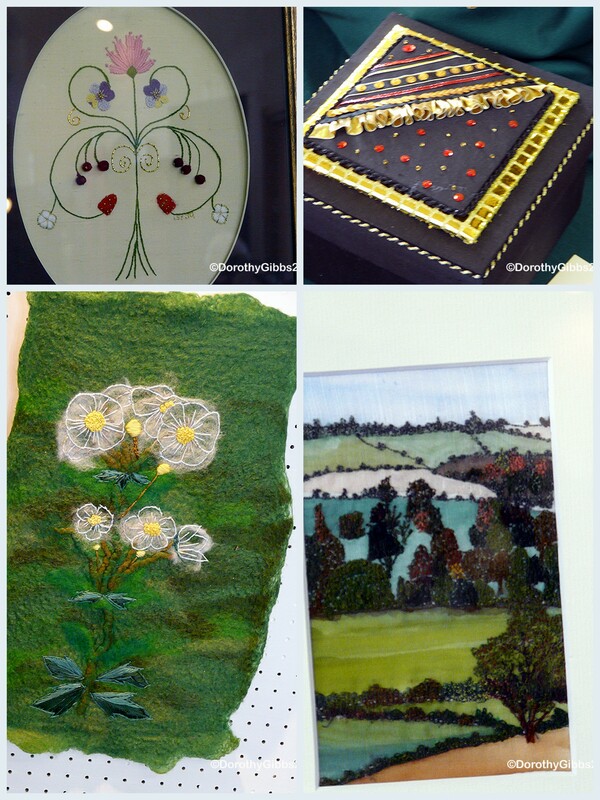 Next we have the young embroiderers’ display. Very mixed ages, haven’t they done well? I apologise for the reflections of the church windows in some of the exhibits, rather difficult to avoid them! I loved the elegant boots and the Mary Poppins especially in the first collage. 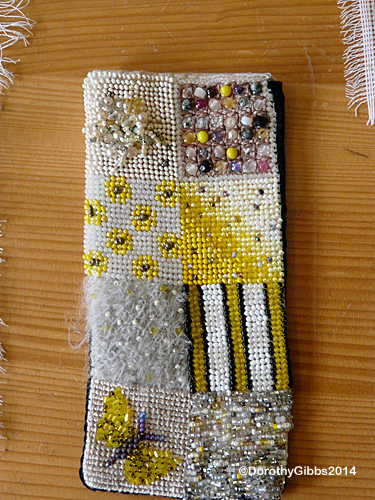 The beading was part of a workshop we had with Eliza MacClelland. 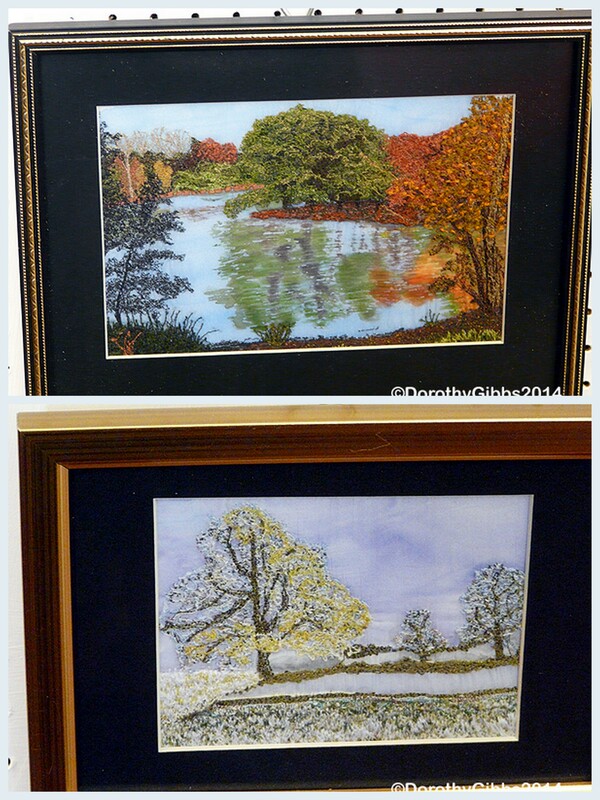 In the second collage we have free machine embroidery Reflections and Frosty Morning. 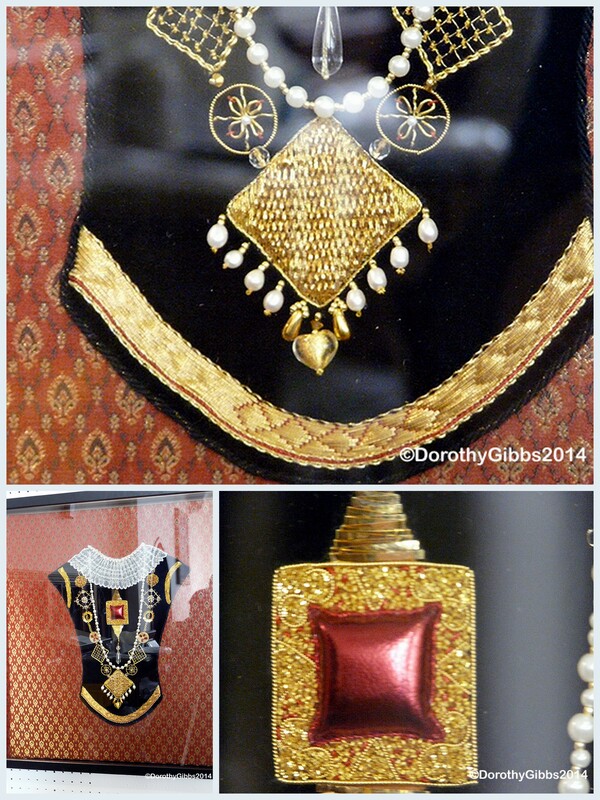 I enjoyed this rather splendid piece embellished with gold work too. 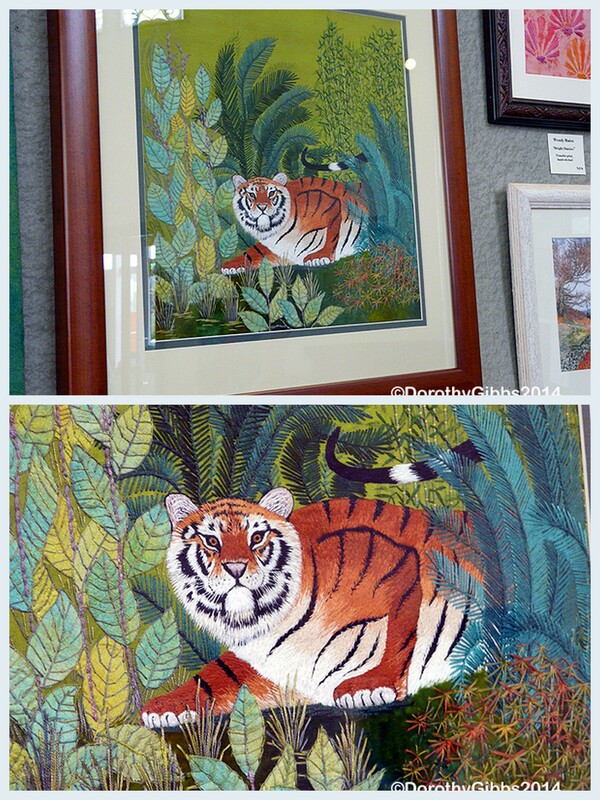 Several different techniques in the first image but the tiger image in the second is a lovely piece of mixed machine and hand embroidery . 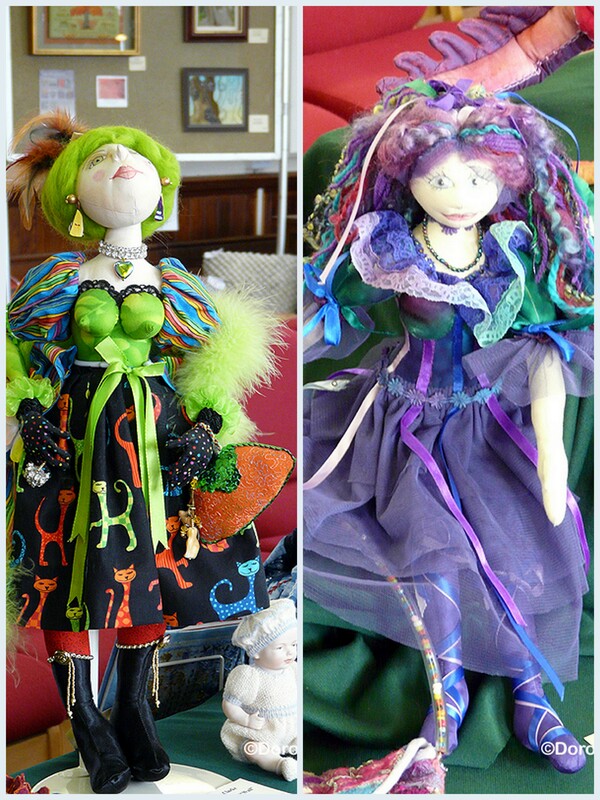 Finally some dolls. 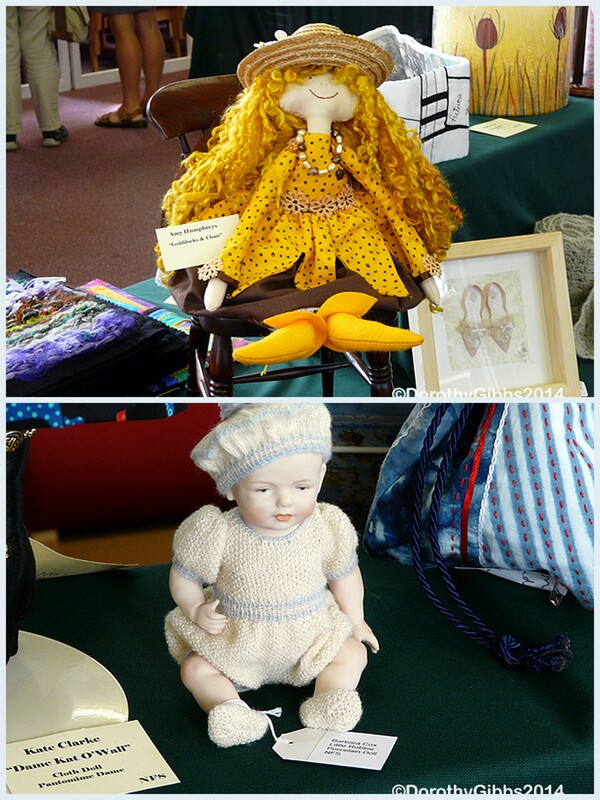 Miss Buttercup on her special chair and Bobbie, a beautiful old porcelain doll in his newly knitted clothes. He was quite tiny… no more than 6″ high I think. All in all a very successful exhibition showing the wide variety of talent we have in the Branch. 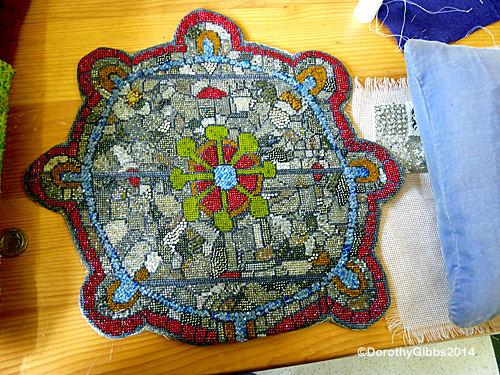 This entry was posted in Stitching Related and tagged Beading, Free Machining, Goldwork, Stiching on August 18, 2014 by dorothyag. 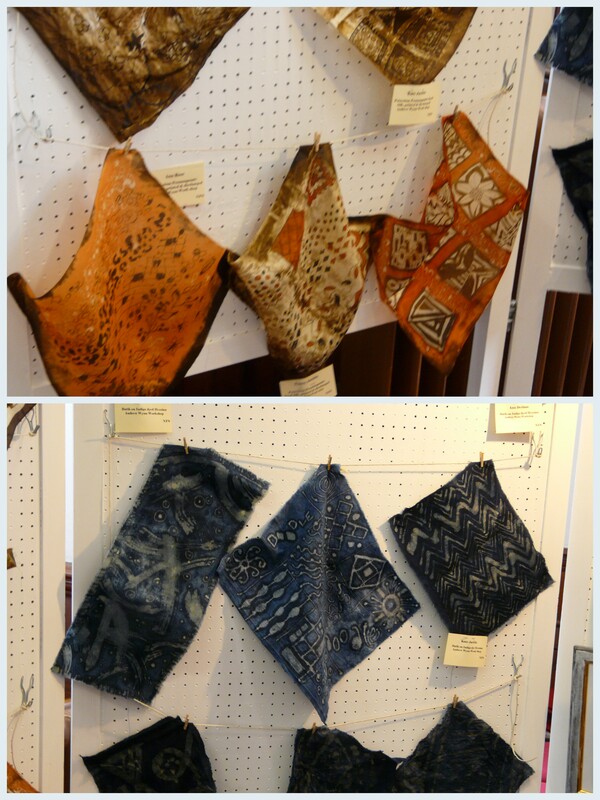 We held a very successful exhibition last week. 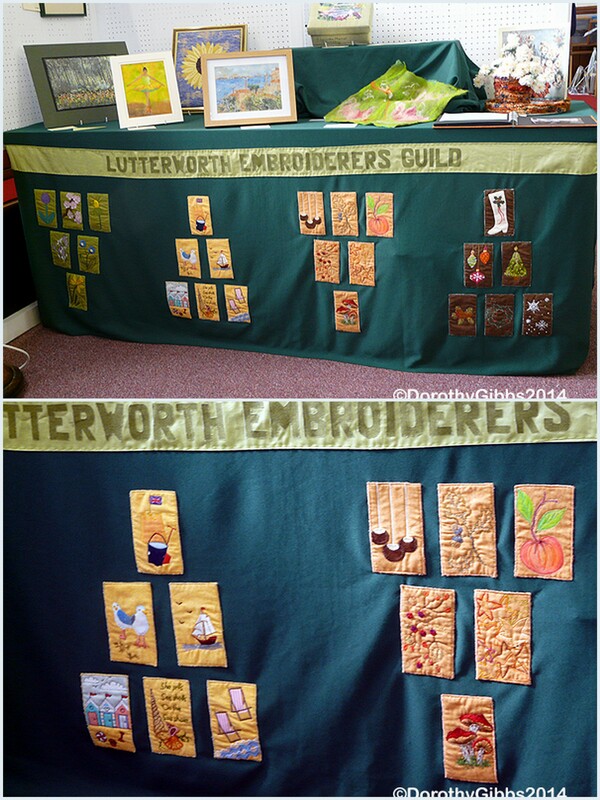 Lutterworth was celebrating Feast Week and also holding various events as it’s memorial of WW1. 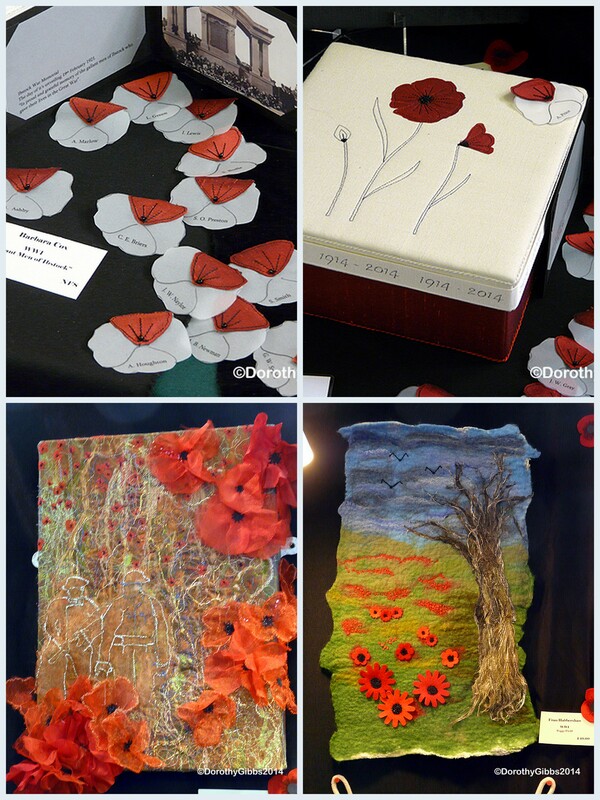 The Guild had an exhibition of work made in honour of those who served in WW1 as part of the overall exhibition. Here I am showing you selected works and will upload some others tomorrow. The first two are from the WW1 exhibit. 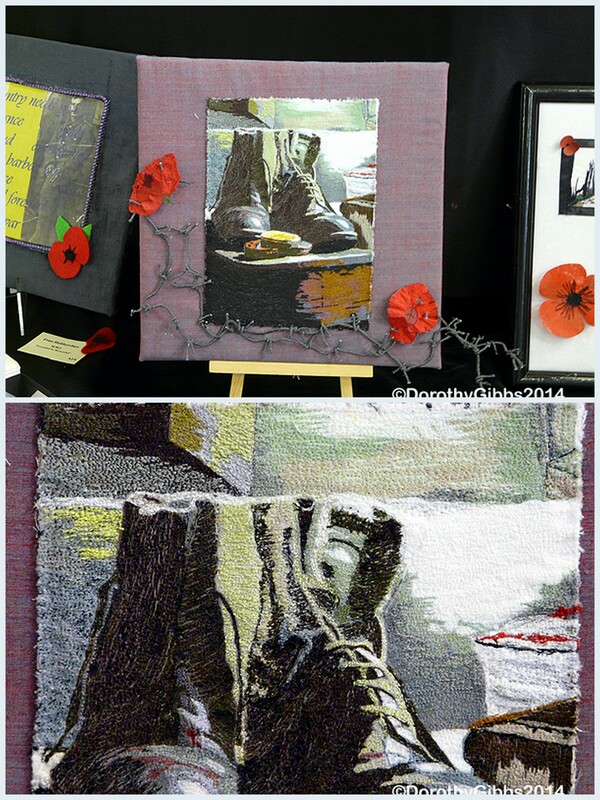 In the first collage the top two images of poppies are remembering the men of Ibstock. 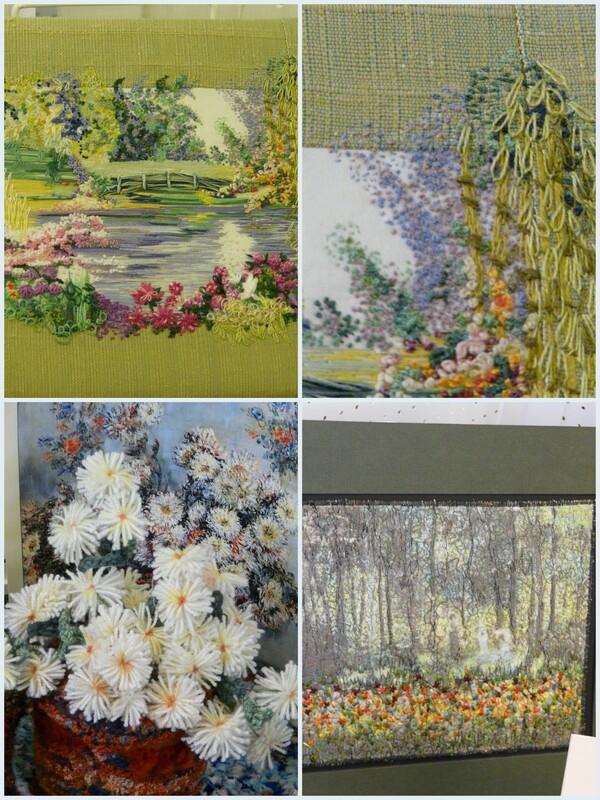 The bottom left image was very beautiful but hard to focus on as it consisted of several layers. 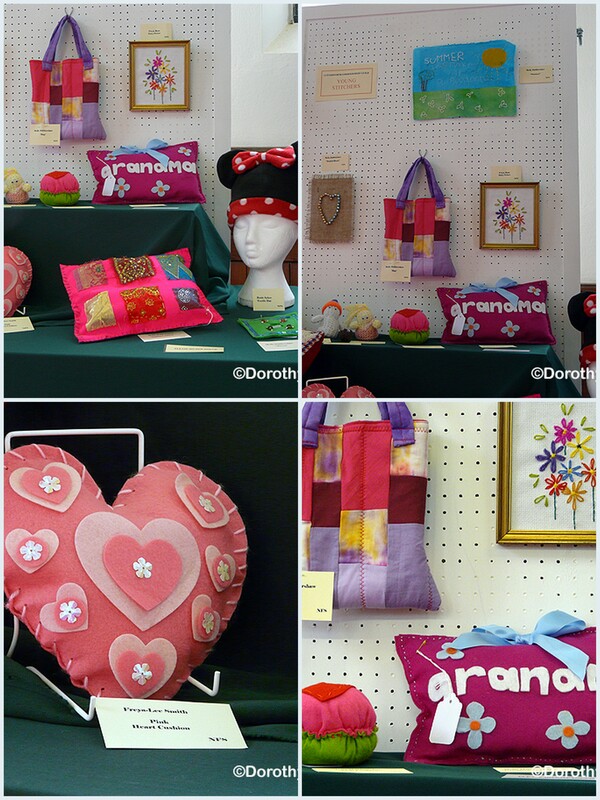 Bottom right was in hand made felt with appliqué additions. 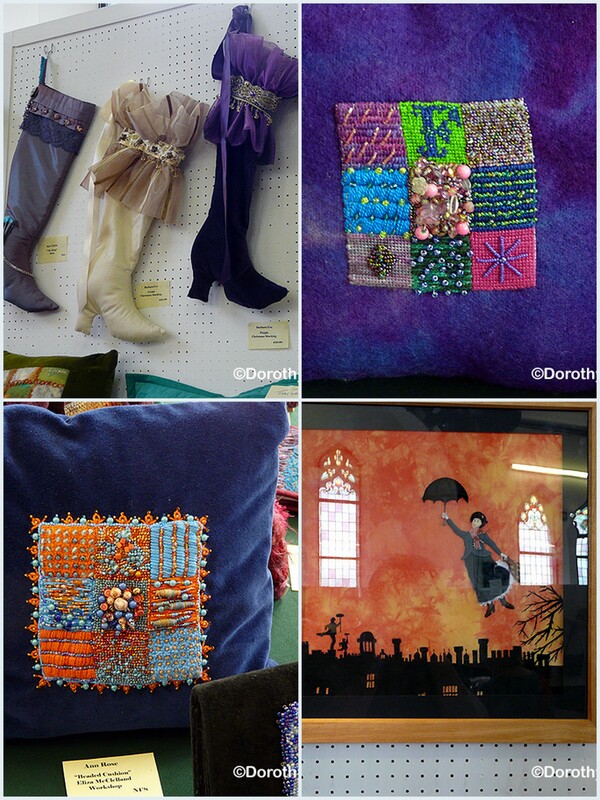 The second collage of the boots was all free machine embroidery, very skillfully done. I have included a close-up. 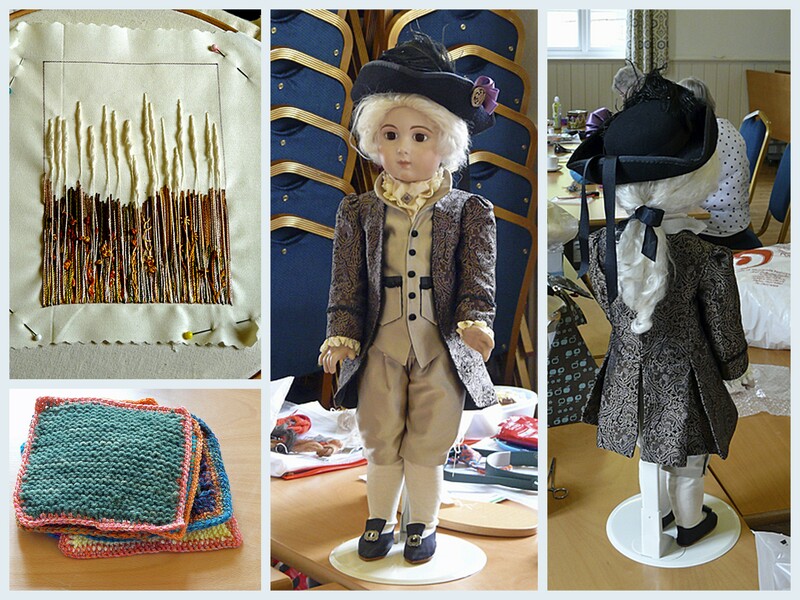 The next image shows some of the entries for the Chairman’s Challenge this year. 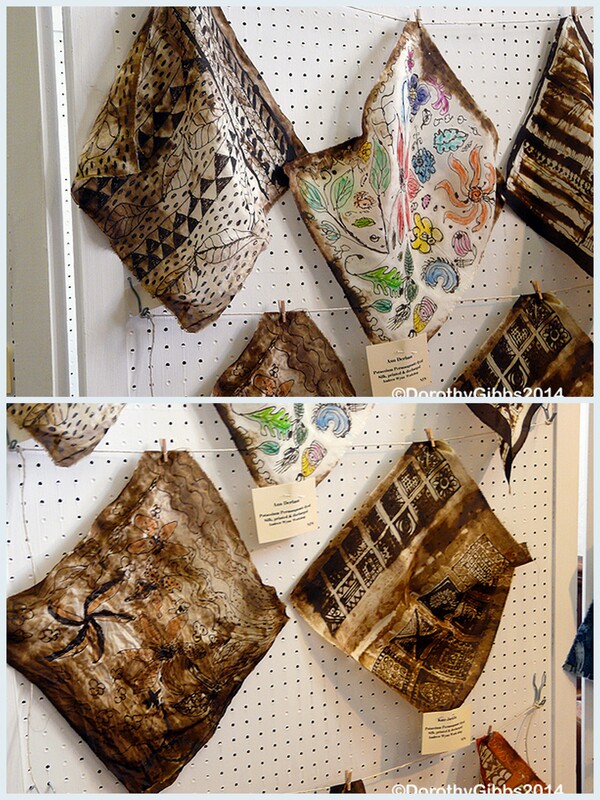 The top one is the winner and is a very lovely hand stitched box. I have also included a close-up. The other two images are my own selection of the rest of the entries. 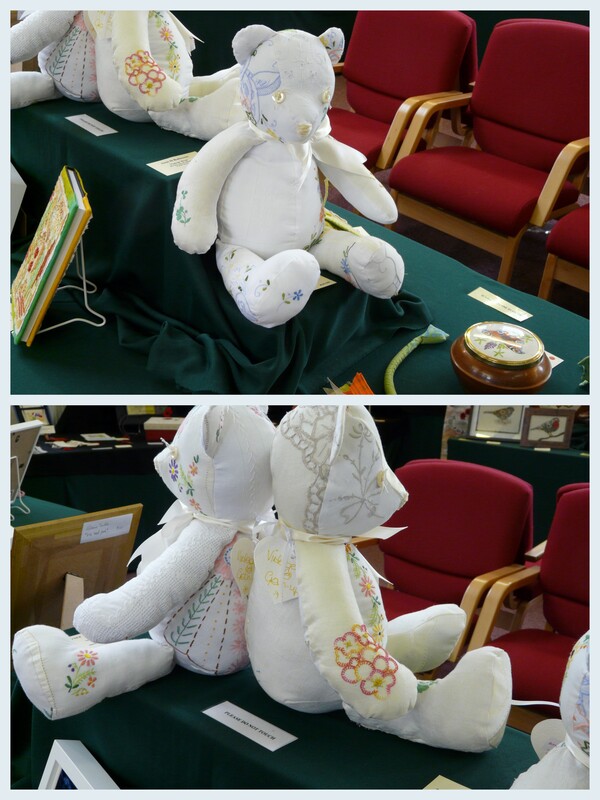 The lovely teddies below are made from old embroidered tablecloths. 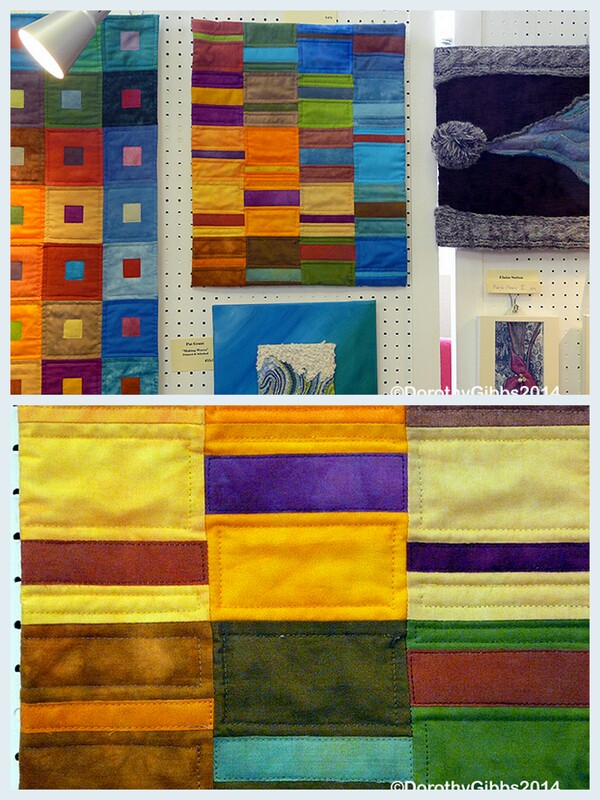 I love the bright clear colours in the patchworks below too. 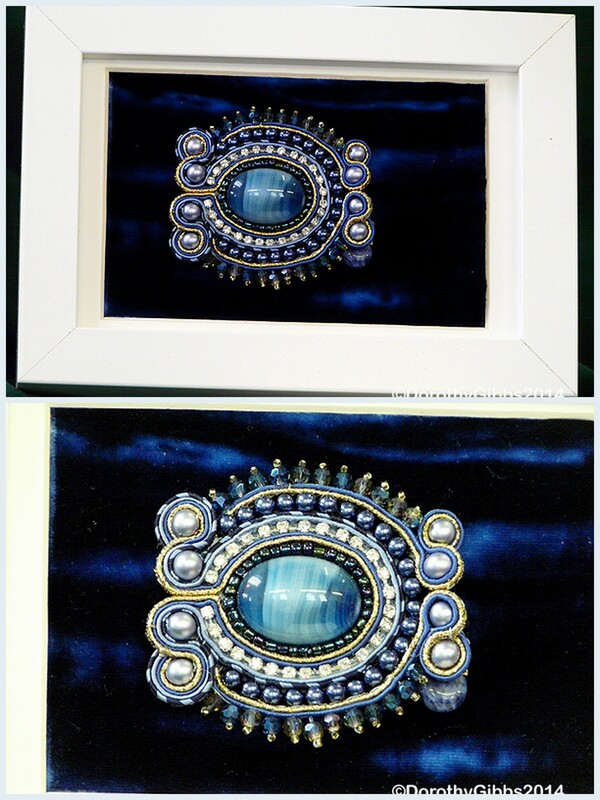 I also like this little velvet picture with it’s beading. 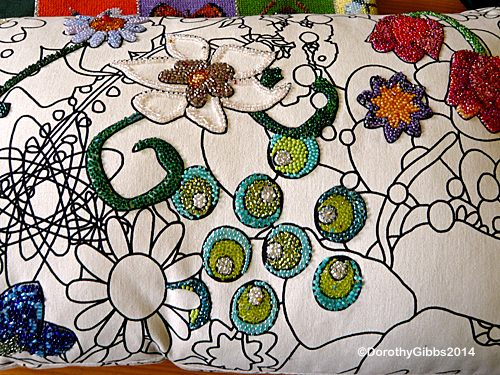 This entry was posted in Stitching Related and tagged Beading, embroidery, felting, Mixed media, Stiching on August 17, 2014 by dorothyag. 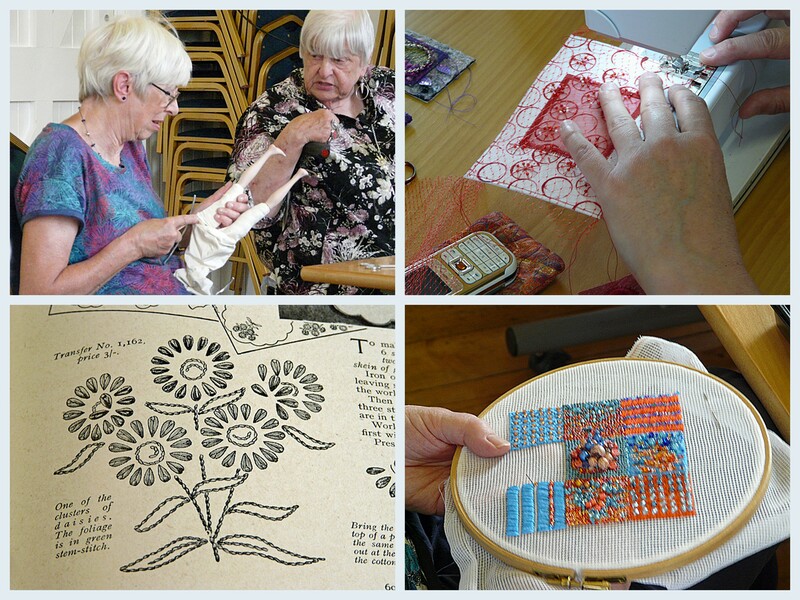 We had a very informative (and fun ) talk from Eliza at Thursday’s meeting folowed by a workshop yesterday. 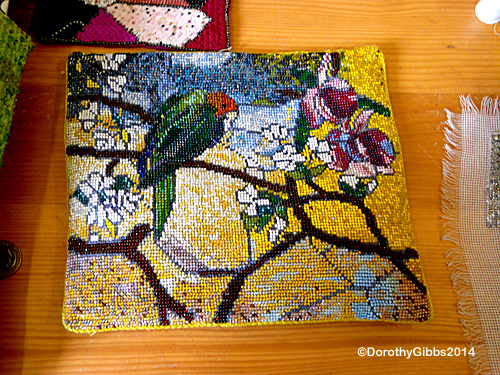 During her talk she passed round many examples of her work some of which are shown in the next few pictures. All of the work is on canvas. 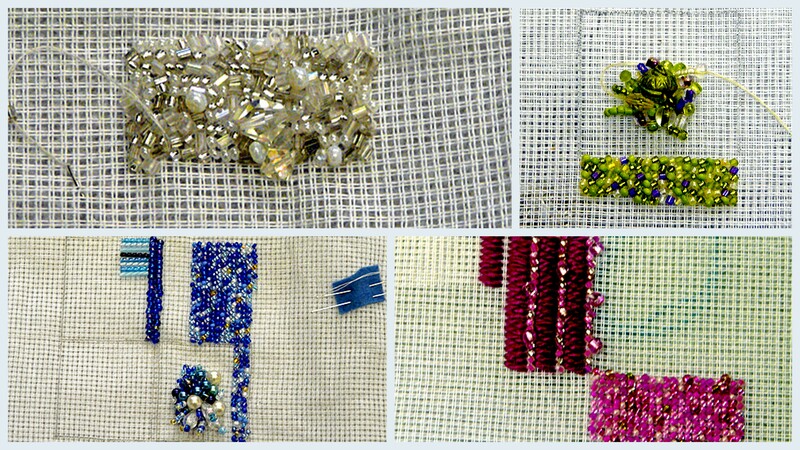 Some on beading canvas and some on waste canvas. This image was taken from one of the windows in York Minster. Lovely example showing such variation in the background of this piece. 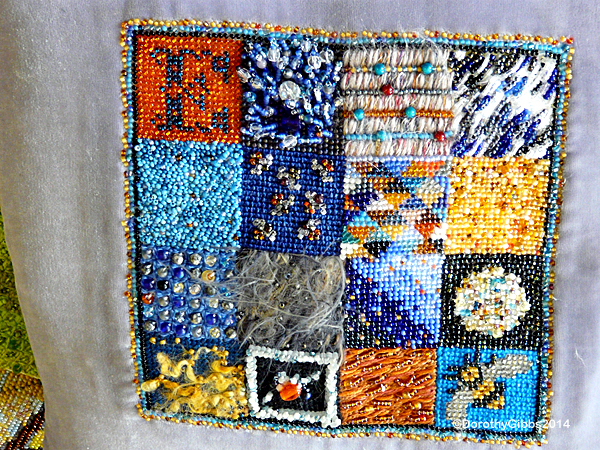 This is an example of her beading on printed fabric used to make a pillow. 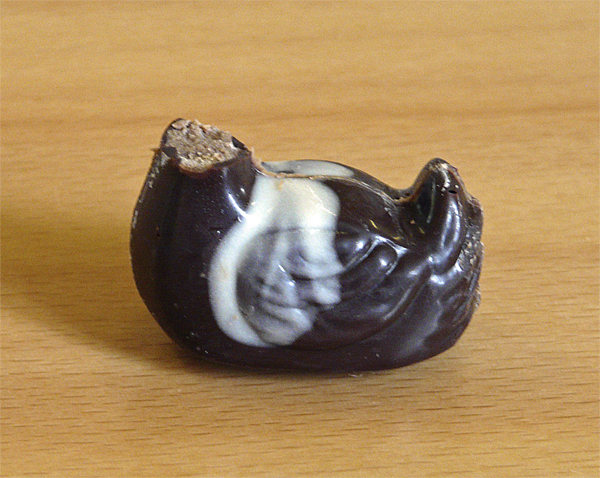 This one is a specatacle case showing several different techniques. 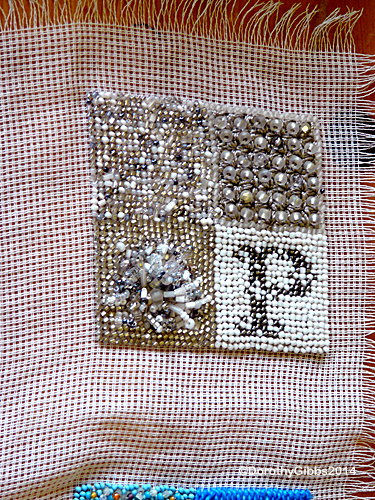 First one of Eliza’s samplers of some of the many techniques we could try. 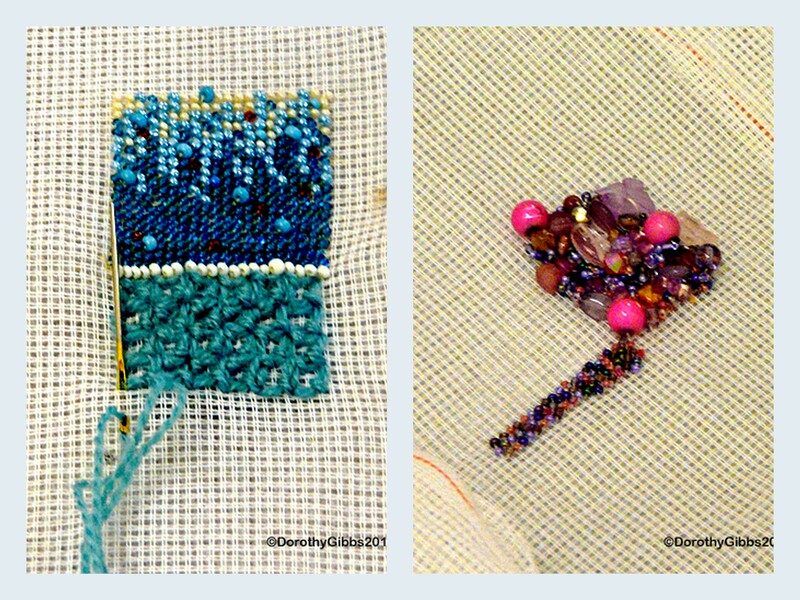 Two more samplers showing more detail with some showing combinations with stitch. 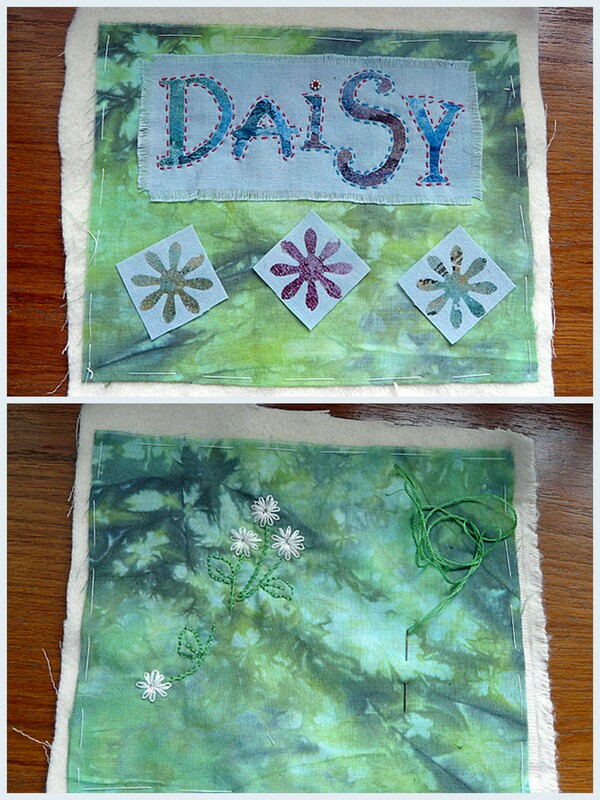 Now here are some collages of our first tentative steps. 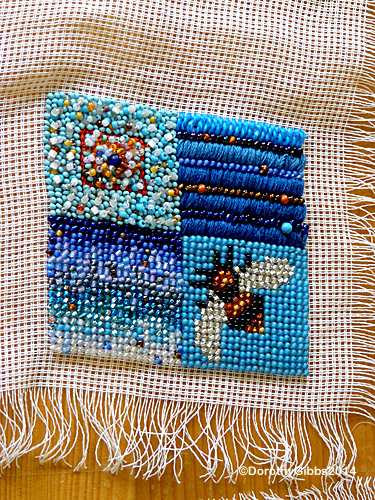 Beading, is of course, a slow process so I will watch progress and post more at a later date. The canvas is actually white but I had problems with the lighting in the room so this was the best I could do. I did manage to avoid the chocolate stains on the work of someone who shall be nameless! I am busy working on mine today as I expect many of the others are too. 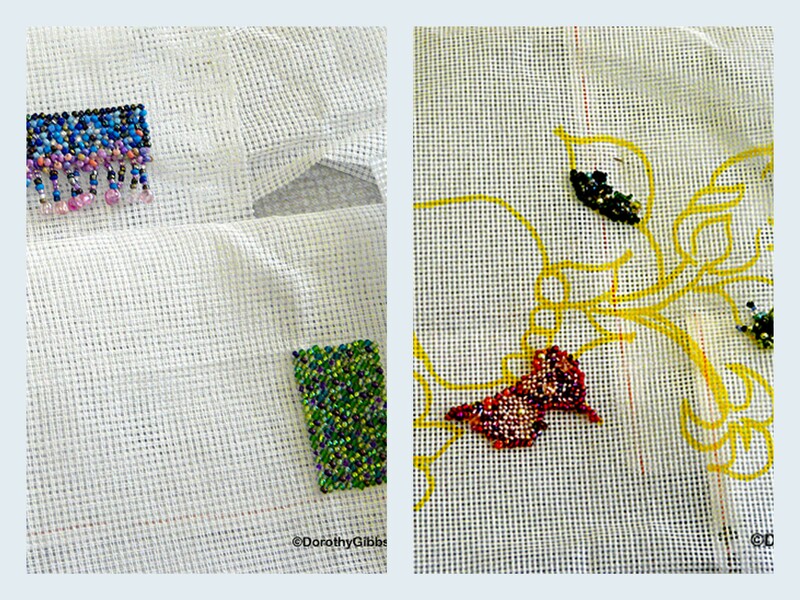 This entry was posted in Stitching Related and tagged Beading, Canvas, Stiching on June 29, 2014 by dorothyag.